At 38′ long the Momentum M-Class 348M from Grand Design is an incredibly spacious toy hauler fifth wheel that can sleep up to 8 people. This makes it a great choice for RVers with large families and those who plan to accommodate several guests while they travel. It boasts a 117 gallon fresh water tank, 104 gallon grey water tank and 52 gallon black water tank. A 12’6″ garage offers room for all of your favorite toys, while the luxurious interior promises comfort wherever you are. 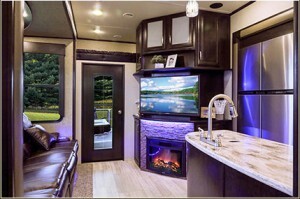 Situated at the front of the RV, this huge bedroom includes a queen sized bed that promises a great night’s rest. Above the bed is ample storage, while two nightstands are situated on either side of the bed. One slide holds a closet. In the garage you’ll find a loft bed. This side aisle bathroom is accessible via the hallway and includes a shower with a skylight and a seat. Overhead storage is situated above the toilet, while across from it is a lavatory. Designed for maximum comfort, this living room includes a slide that holds a sofa and stowable table. Along the wall that separates the living room from the bathroom there is an entertainment center with a fireplace. You can kick back and relax while watching your favorite movie or enjoy a glass of wine by the fire! Situated across from the living room, this kitchen features an island where you can easily prepare food or lay out a buffet to serve the family. Along the wall that separates the garage from the living room there is a double sink with overhead cabinetry. One slide features an 8 cubic foot refrigerator (optional 18 cubic foot), three burner range, over the range microwave, and a small pantry. A larger adjacent pantry is located along the wall that separates the living room from the bathroom. This 12’6″ garage boasts overhead cabinetry and optional Happijac rollover sofas with a top bed. Washer/dryer connection means you have the convenience of doing your laundry wherever you are, while the loft bed provides additional sleeping space along with an LED TV. If you’re interested in learning more about the Momentum M-Class 348M contact us. 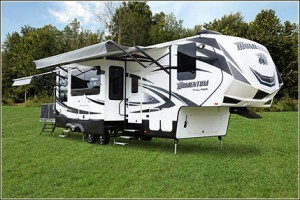 As your New York toy hauler dealer we are here to help you find the right RV for your needs and make sure you get answers to any important questions you have.